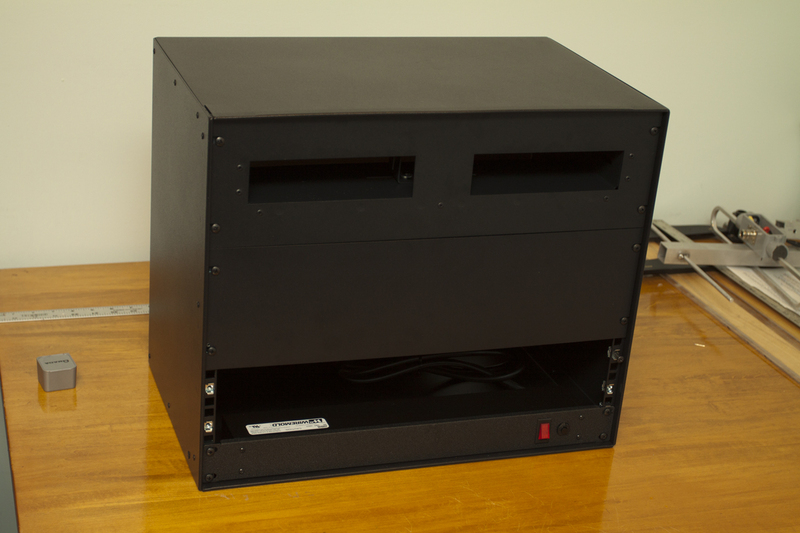 Custom 19″ Cabinet for a portable repeater. This project is more related to sheet metal design than Ham Radio because the fact that it could be used for more than just radios. 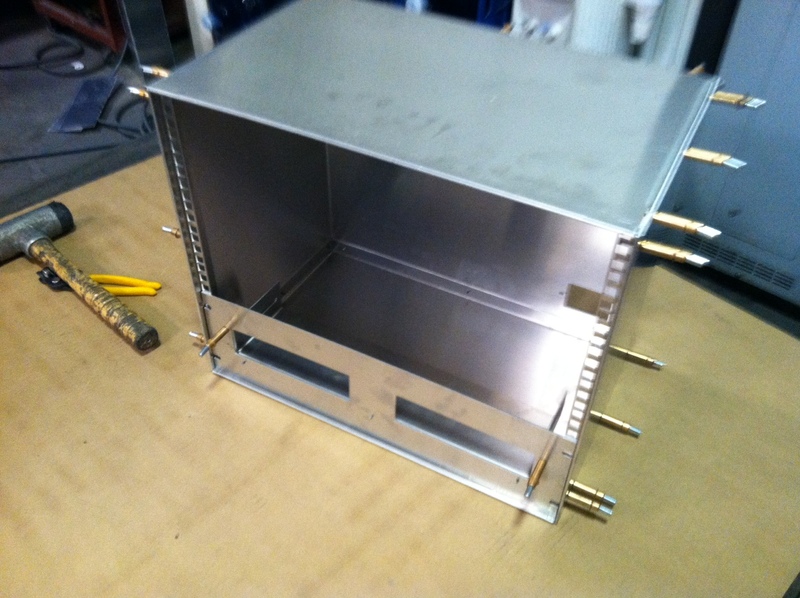 A friend/fellow operator asked me if I can build a 19″ rack mount for a portable repeater. I’ve learned over the years to NOT volunteer my time and/or services because it can lead to a lot of trouble and out-of-pocket expenses. 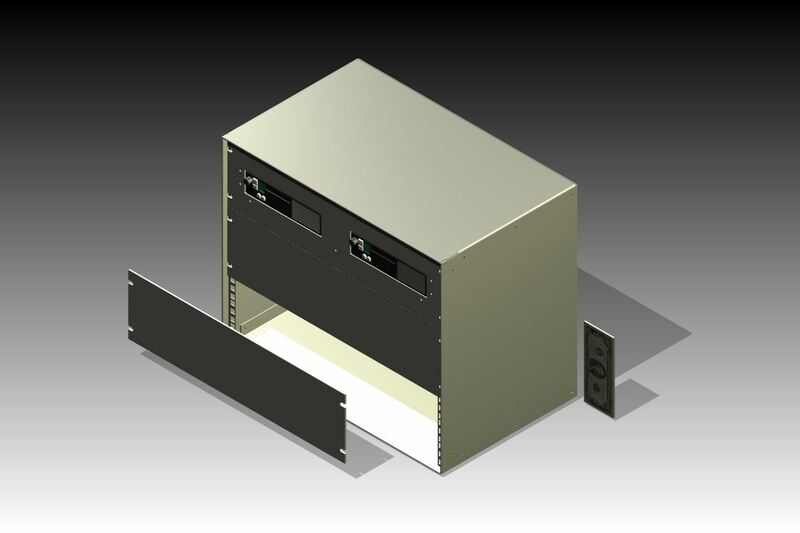 But I owed it to him and I actually always wanted to design a desktop rack mount. Since time is of no worry, I felt comfortable working on this project. 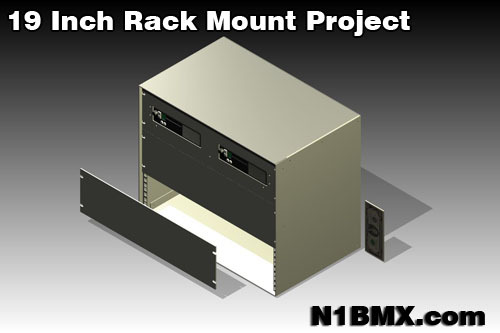 For those who don’t know what a “19 Inch Rack Mount” is. 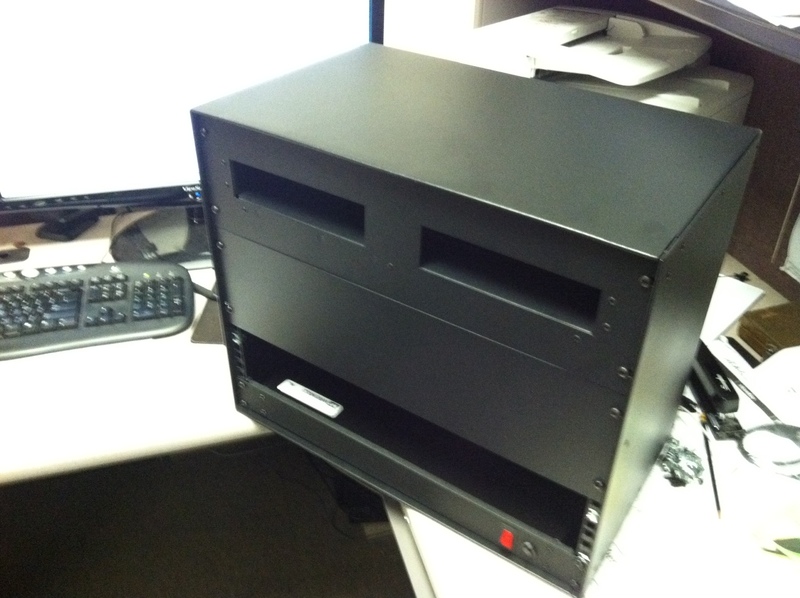 It’s a standardized frame or cabinet/enclose for mounting equipment modules (i.e computers, radios, telecom equipment, and etc). 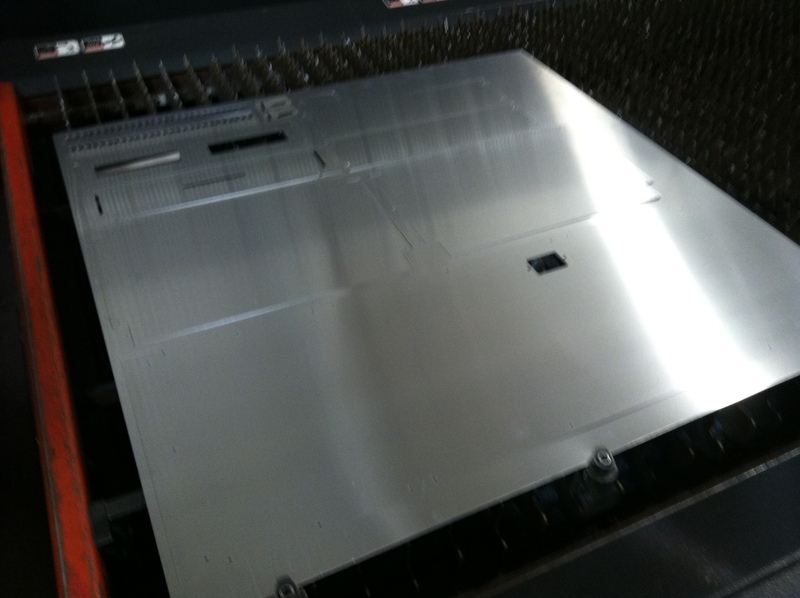 These modules have a front plate that is 19″ wide which have holes/cut outs to allow the module to be mounted to the frame that has a standardized pattern. Since it’s a (EIA) standard in the industry, designers and fabricators have the basic foundation to design their product off of. There is also a 23″ rack but the 19″ dominates the market at this point in time. Having a standardized system makes the design aspect a lot easier to tackle. 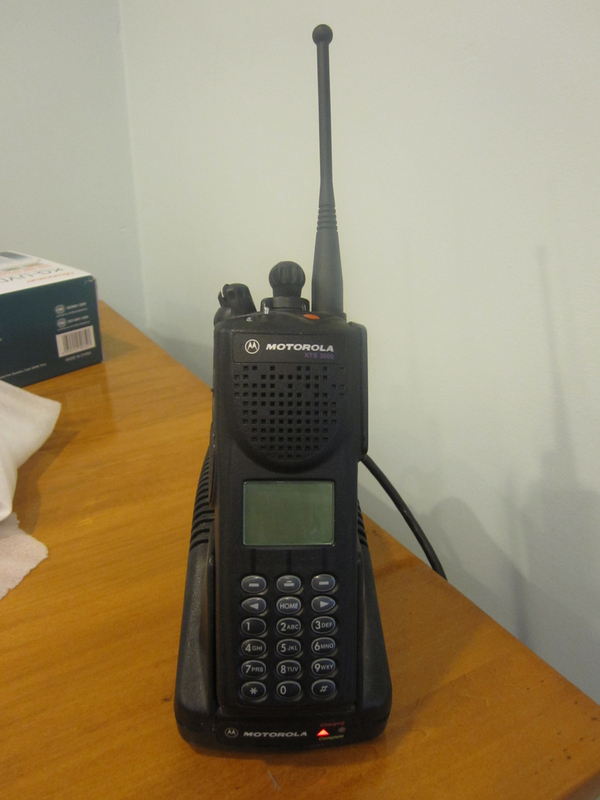 All I really had to figure out were the dimensions of the Motorola CM series radios. Once I had that, It was actually quite easy to design. I’ve personally dealt with these type of racks in fabrication, but I have never had a chance to actually design something using this standard. Hence the main reason I am making a this cabinet. I’ve learned quite a lot from this project that will make me look just a little harder when it comes to similar projects. Here is the 3D rendering of what I designed. On a lot of my projects that involves showing the image of the render before fabrication, I added a dollar bill to the project as a reference to size. It actually took about a couple of hours over a span of 3-5 months to design. Here is everything after laser cut in the flat. Little bit of deburring to take off any dross/slag and off to the bender! 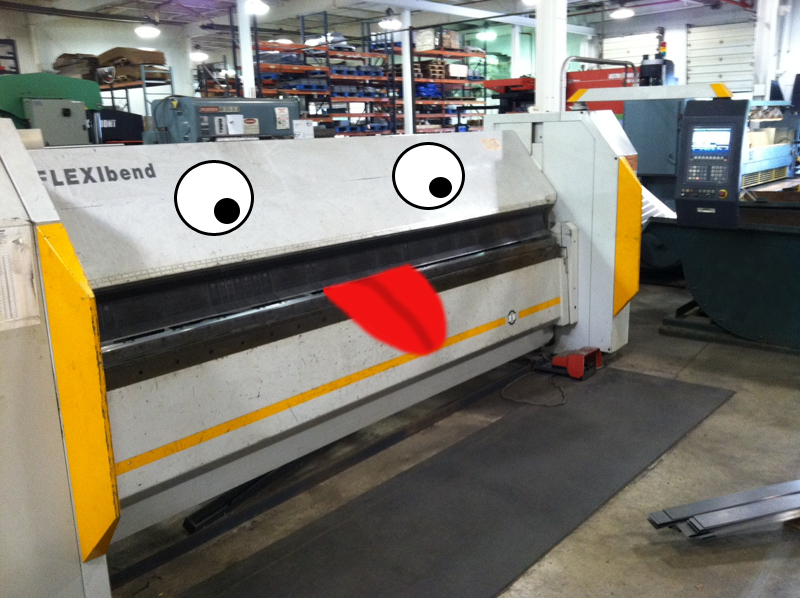 I wasn’t able to snap a picture of the machine actually bending up the cabinet but this is the machine that did it. It’s called a Panel Bender and works great for projects like this. 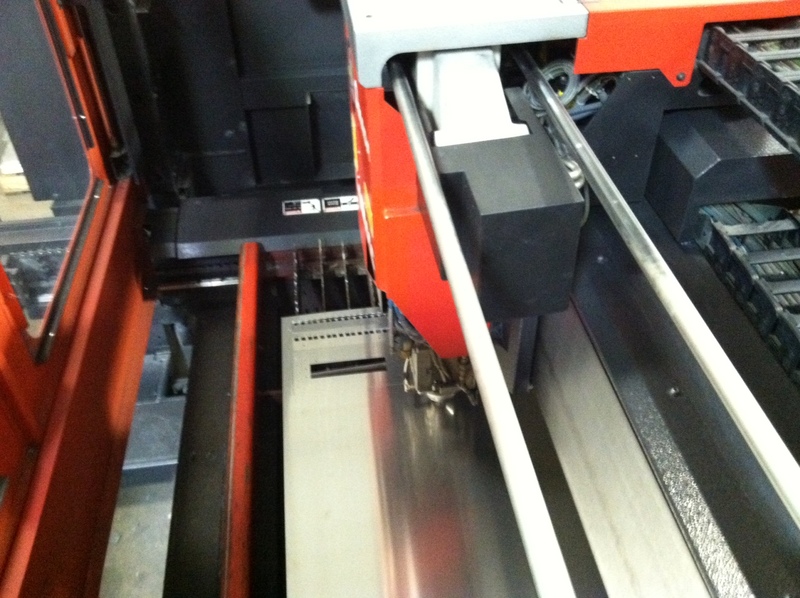 The tooling is already installed and all you do is punch in a couple of numbers and off to the races. With this project and the time constraints, I bent every part by eye without using the CNC gauging system (takes longer to program the machine). I knew I was going to bend by eye so when I programed the part for laser cutting, I added little cutouts to physically show where I am going to place a bend. Line up the little cutouts with the tooling on the machine and it will put the bend within the tolerance that I need for assembly. Here is the box after bending. I did a test fit by assembling all the parts. In the design I added 1/8″ diameter alignment holes. These holes when lined up and used with cleco pins (sort of like removable rivets) , will temporarily hold the panels together. This will allow me to either weld, spot weld or take one cleco pin out at time and replace it with an actual rivet. Here it is all assembled and ready for paint. I decided on a black texture powder coat because it’s used often in the industry. Plus it hides my fat greasy fingerprints quite well. And there she is… Ain’t that a thing of beauty? I placed a 2U power strip just to illustrate that how universal it can be. Well that’s basically it. This little article is to show to process from the thought to design and from design to build. If I were to even build something like this, I would use thicker material and stick to the specs on the standard a little more closely. I would also add handles and reinforce the area where the handles are mounted. 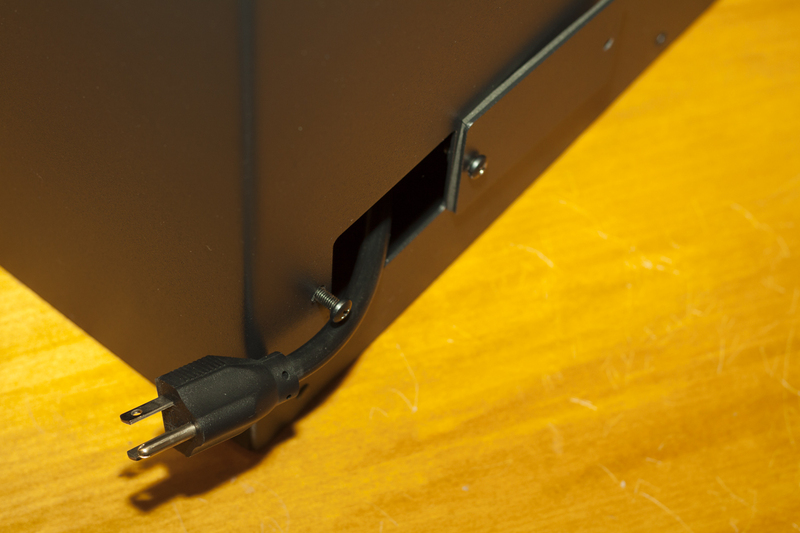 Here is a upclose shot that will show how the panels or modules are mounted. 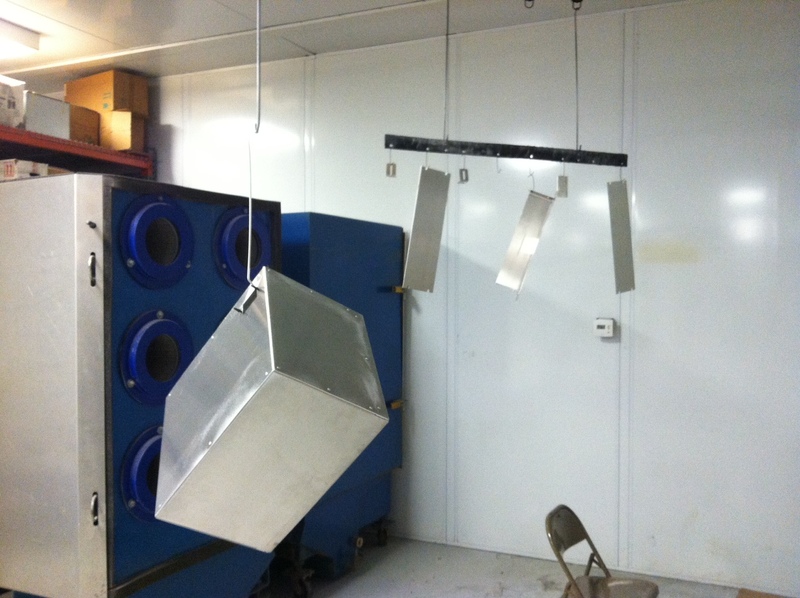 Depending on the design, some rack systems have sliding frame rails to extra weight support. The silver looking thing you see is actually a spring clip with a floating #10-32 nut. Back when these racks were first being designed, instead of using a square hole with a captive nut, they just had regular round holes that were drilled and tapped. Problem was if the threaded hole were to become stripped due to major use or misalignment, then the entire unit could be scrapped if it couldn’t be repaired. With the new system, you can just pop in a nut where ever there is one needed. If it gets stripped, just replace the nut! Here a picture of the back of the unit. 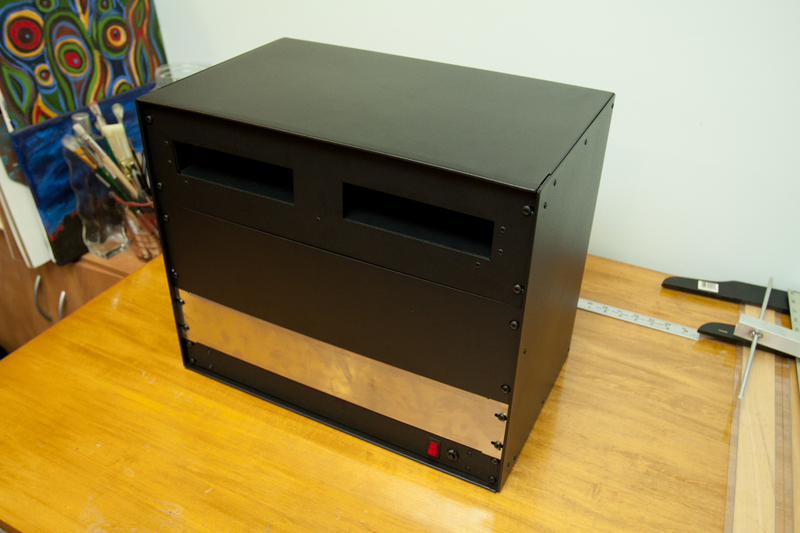 I created a 2X3″ in opening to allow cables to be routed through. 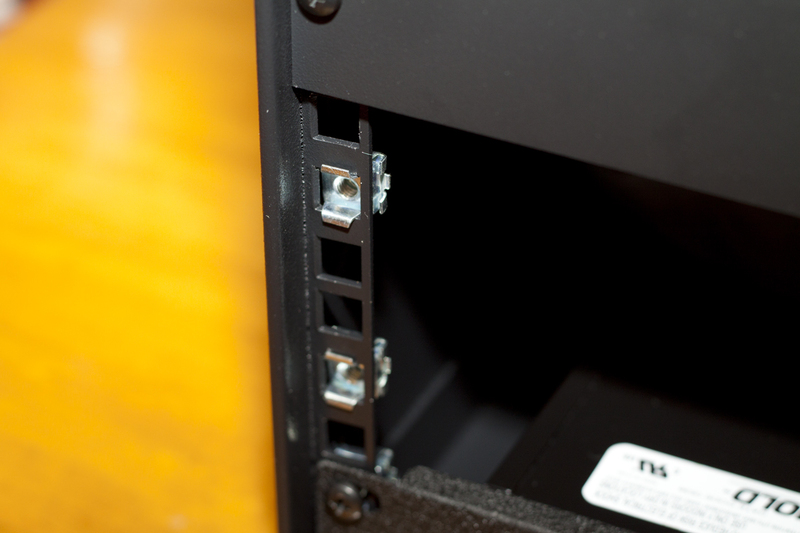 When not in use, the gasket-ed cover can bolt right into place using two #10-32 screws that screw into pressed inserts on the main body to create a nice air/weather tight fit (even though the rest of the unit is not air tight). 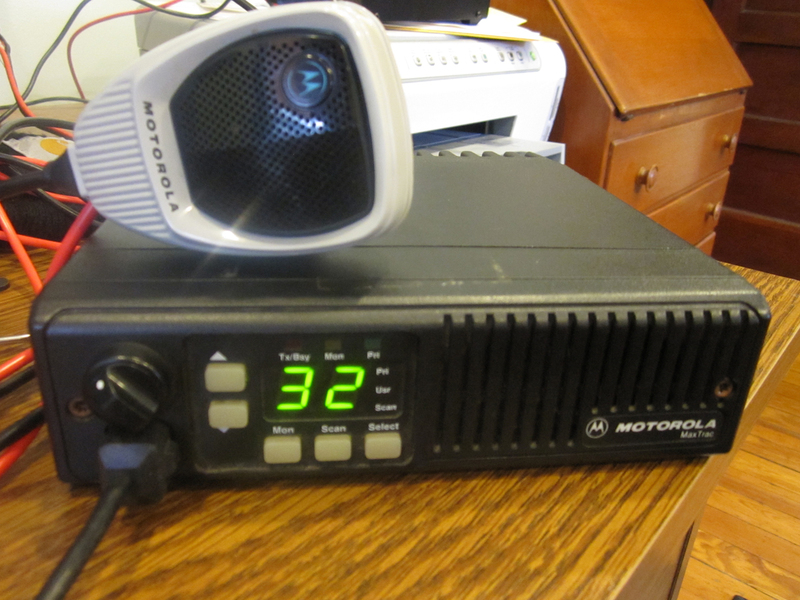 Here it is with the radios installed. Considering this is the first time I actually got to physically handle the radios, everything lined up okay considering I was using the specs from a similar radio for it’s dimensions. Overall it was a great build, I just might build another one and apply what I’ve learned on the new box If by some chance you have the chance to fabricate something similar, I would use 1/8″ Aluminum or 12ga (.105″) steel. 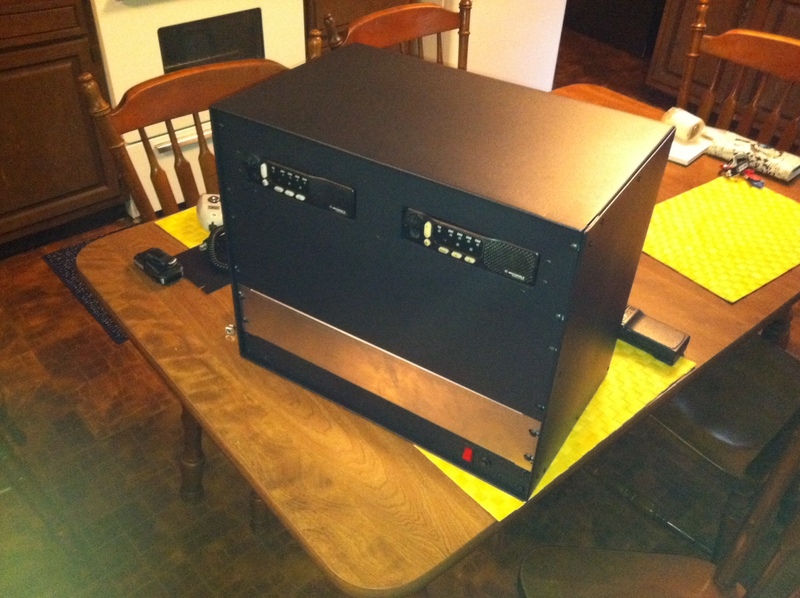 Author NT1KPosted on September 29, 2011 November 8, 2011 Categories General Ham Radio, ProjectsTags 19 Inch, 19", CM, Enclosure, Metal, Motorola, Mount, Panel, Rack, Rack Mount, Radio, Repeater, Sheet Metal1 Comment on Custom 19″ Cabinet for a portable repeater.